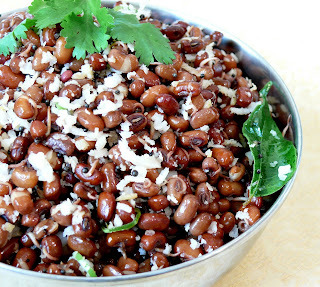 Sundal is made with almost all beans and lentils in Tamil homes for Navarathi. Usually beans are soaked the previous night and then cooked and seasoned. Sprouted Red Bean Sundal is a little twist with all the goodness of sprouts~A hearty and healthy sundal for Navarathri. Sprouts start their life as dry beans and seeds. For germination or 'sprouting' to occur they must be soaked in water, then drained. Once wet, they draw on their stored nutrients and begin to grow. 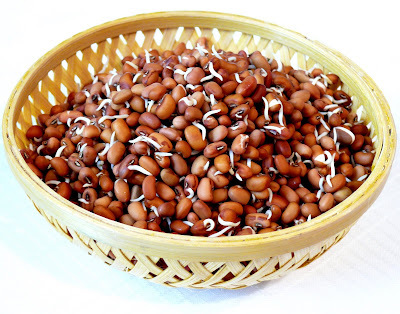 Sprouting increases the nutritional value of seeds and converts starches to sugars, making them easy to digest. Medicinally and nutritionally, Sprouts have a long history. Ancient Chinese physicians recognised and prescribed Sprouts for curing many disorders as far back as 5,000 years ago. Adding Sprouts to salads, sandwiches, soups, stir fries and our very own Sundal will make a world of difference to our health. There are many varieties to choose from, with each Sprout having it's own unique flavour and health benefits. Soak the beans overnight in plenty of water. Next morning, drain the beans and place them in a clean muslin cloth. Cover the muslin loosely and sprinkle the cloth with water. The beans should sprout the next day. Sprinkle water occasionaly if the cloth looks dry. Boil a cup of water in a vessel. Add the sprouted beans. Cover and cook for about 15 minutes for the beans to become tender soft. Add the salt and mix well. Heat a tablespoon of oil and add the ingredients for the seasoning in the order given. Add the seasoning, grated coconut to the cooked beans and mix gently. Serve as an appetizer, snack or salad. This goes to Sra's My Legume Love Affair event conceptualized by Susan. Very nice, and nice background about sprouts, will keep that in mind. A very delicious item and popular in South India.Good presentation. wow, this is a delicious and healthy way to make sundal. looks so good. I like the bamboo basket in the second pic. Where did you buy that? Thanks Uma, I got the basket from India. First I must say..Picture looks so Good. Happy Dasara to you and your family. Sundal looks so delicious..was the tutorial usefull suj? Thanks Lavi for the comments and the tutorial. It was indeed useful. Cilantro, that certainly looks attractive! Thanks for the entry. Sundals are so easy to make and so good for you too. I usually make mine with kala channa. wow, this is delicious and easy recipe. Is this rajma beans? Mandira, rajma beans are different. Red beans are in the size of whole moong beans. You could substitute rajma though. Looks yum! Can any bean be sprouted, no matter how old and dry? This looks like a delicious and hearty meal :). I would love to include your recipe in our pre-loaded Demy, the first and only digital recipe reader. Please email sophiekiblogger@gmail.com if you're interested. Susan, You can sprout any bean as long as they are dried. If the beans are very very old then I may think twice before using them. Two or even three months in the pantry is ok in Seattle where I live but same may not be the case elsewhere. In hot climate, the worms get inside them.